I have some marriage records and stories but most all of them involving living or recently deceased relatives. I'm also trying to stick to my theme of only focusing on my maternal grandmother's family (I want to make a book out of these posts for her). Luckily, my favorite marriage record involves my maternal grandmother's grandparents. 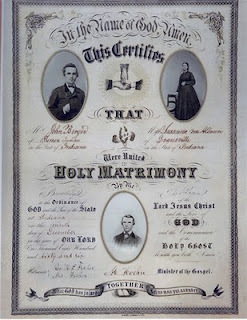 Susanna vonAllmen and John W. Berger were married in Evansville, Indiana (where Susanna and her family lived) on 9 December 1866. I don't know why John was in Evansville but I think he was probably there because of his job as a minister. This marriage record holds a special place for me for several other reasons. It was a gift from a relative some years ago and was the first time I'd ever seen a picture of John and Susanna. It also gave me some of the information I needed to eventually break-down my vonAllmen brick-wall. One thing of note about the record is that it includes a picture of the minister who married them. It is the first time I've ever seen this done. Though, I'm sure the actual record (I think this is a ceremonial copy) probably lacks those pictures. How wonderful to have the actual photos of the relations involved in the marriage. I have never seen a marriage license like it. I have seen some fancy marriage ceremonial certificates too, but, have not found one like this beauty. Photos, how wonderful. Excuse me while I go clean drool off the keyboard. Fantastic family heirloom.